Mmm! What a gorgeous diaper cake! 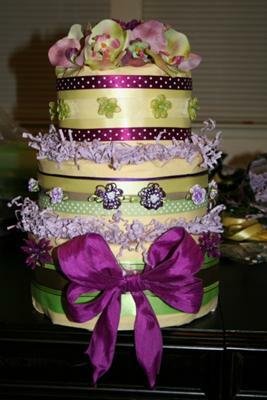 Everything I love in a diaper cake...fabulous colors, lots of texture, a stylish variety of ribbon, and darling embellishments. Kandace really outdid herself with this one! Her cake is such a delight to look at! I'm betting the expectant mother was absolutely thrilled to be presented with this. Just beautiful! Kandace has joined with hundreds of others of our amazing visitors to this site who have taken it upon themselves to share their creativity with the world by submitting their diaper cakes to our gallery and inspiring thousands of others around the world who are looking to create something special and unique to celebrate a new little life. We love and appreciate the efforts of all of our submitters, like Kandace! Thanks so much for sharing your incredible, beautiful diaper cake with us Kandace!! If you have a diaper cake to share with us, send it on over right here!